Three years ago I had a great idea. 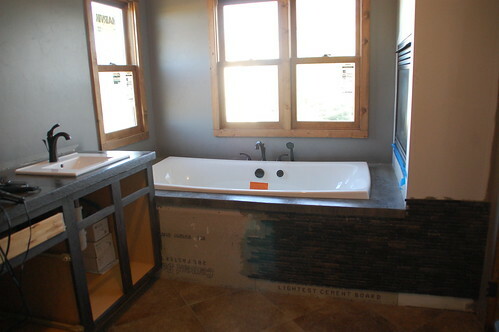 An idea that was mostly driven by my desire to have one bathroom in this house that contained a tub suitable for soaking. Anyone remember this tub (with an effing fireplace?!) from my last house? Yeah. Me too. With pain in my heart every time I think about it. This house has three full bathrooms, and, for the first 3 years I lived here, zero working bathtubs. 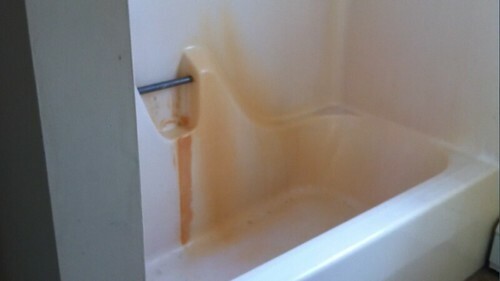 I mean, there was one, kinda, but if you put more than 6” of water in it it started to leak… and it also had iron stains that made it look like someone had previously been dismembered in there. So, back to my great idea. 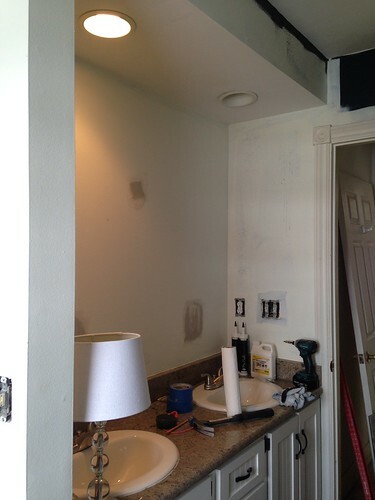 Three years ago I decided to do a “quick” overhaul of the upstairs bathroom. 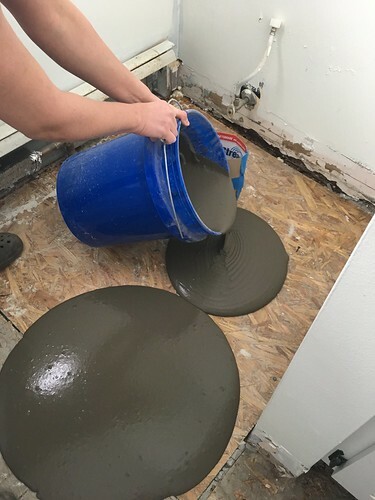 In my mind that meant taking out the old tub (which meant the old tile had to come out too) then putting in a new tub, re-tiling the floor, and maybe a coat of paint. Voila! Done! Right? I mean. 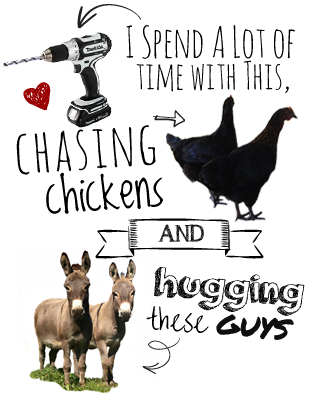 I could have picked any hobby in the world. I could have been a person who golfs. But no. I had to pick the one that means I’ve spent more hours of my life then I care to think about scraping up subfloor that has been rotted and soaked through with sewer water. And then, guys, I just straight-up ignored this room for the last couple of years. I mean, literally every time I woke up in the middle of the night and had to pee, and then had to walk downstairs and to the opposite end of the house… at those times I was keenly aware of my failure to get the upstairs bath finished. But otherwise I mostly just avoided the idea of finishing this room. I probably would have gone on that way for another year but when my mom was up at the house for Christmas and I was talking about my 2018 projects, she gently steered the conversation in the direction of the upstairs bath. Like, she might of mentioned how much my quality of life would be improved by having a working bathroom upstairs, and then didn’t say anything else about it until she showed up at the farm every weekend for the last 2 months with a bottle of wine and innocently asked what we’d be working on in the bathroom that day. She gets all the credit for the progress I’ve made on this room so far. I’d been very leery about using a pour-on self-lever for a lot of reasons, mostly involving prep, but I figured I couldn’t have made a worse mess than my first attempt, so used a spray foam insulation to seal any gaps between the old plaster walls and the framing, and rigged up a cardboard “seal” around the toilet plumbing. 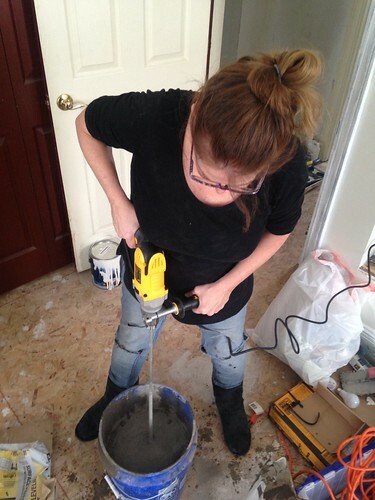 While I poured the leveler and worked the float. 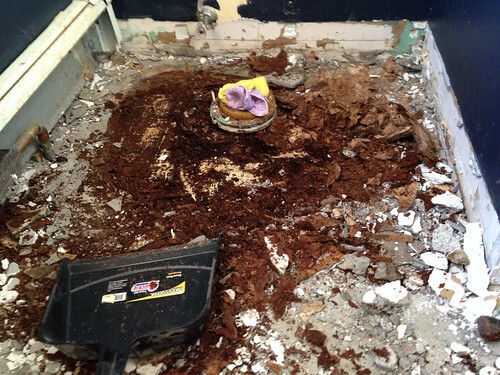 One of the many joys of a 170 year old house is that this bathroom floor was ¾” off-level over a 3-foot run of floor. Which is to say, it required a second coat of leveler the next weekend. 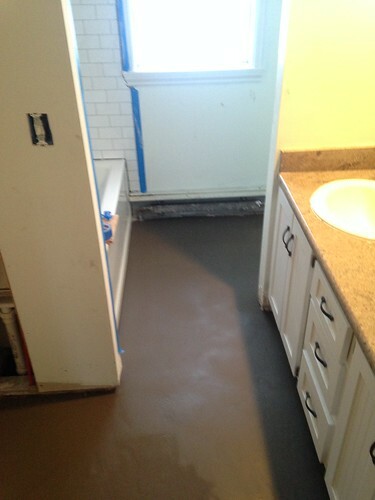 Once the floor was mostly level I installed Schuler DITRA underlayment, and then started with the tile. And, you know, good point. It’s been three years. The last thing I need to do is make this more difficult. So I just ran the tile straight, and they actually look great that way. It’s a lesson in 1.) don’t make things harder than they need to be, and 2.) always listen to your mom and grandma. They aren’t cheap, but The idea made a lot of sense to me and I wanted to check them out. 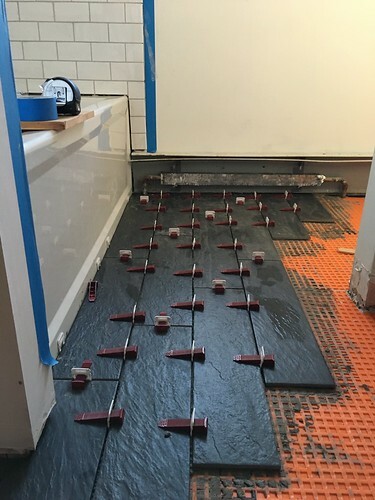 Because I follow the tile guys I know that you have to be very conscientious about backbuttering and having enough mud under the tiles. 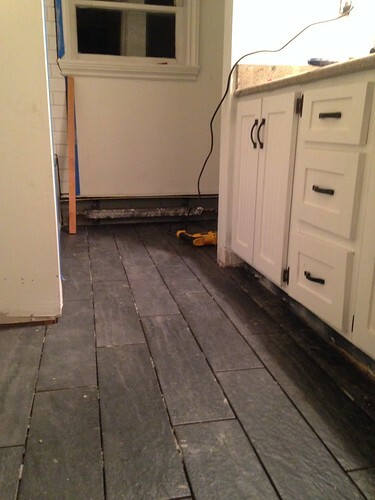 It didn’t make it easier to lay the tile, but I think the floor is probably the best one I’ve ever done because of it. 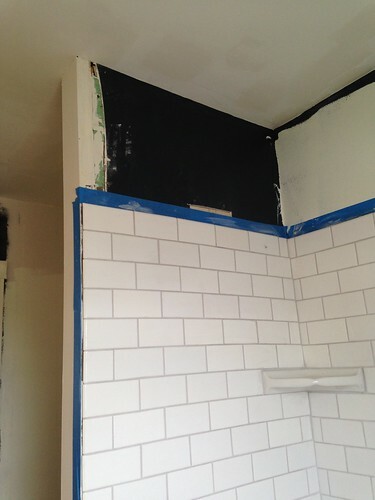 Once the tile was in, it was time to address one of the biggest issues in this bathroom… the plumbing. 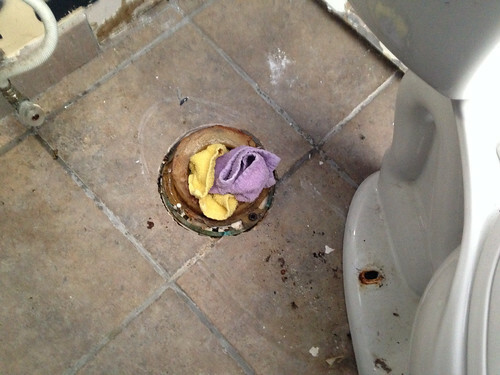 The old toilet had been leaking because the flange for the toilet was set below the tile floor (I assume a product of needing to raise the floor so much to level it.). You can see in this picture, the wax ring was barely dented and wasn’t providing a great seal. I cut out the old flange before leveling the floor, and now that the new tile was in I was set to replace the old soil pipe with a new one. Here’s a thing I love about my life these days. 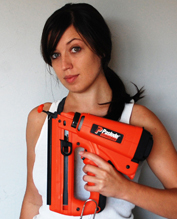 I have a tool for everything. 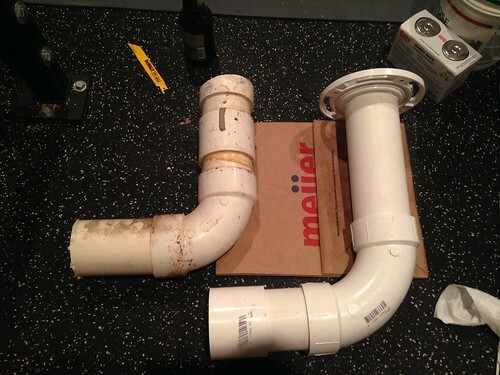 Need to cut a PVC pipe in a tiny space? I’ve got the saw for that. 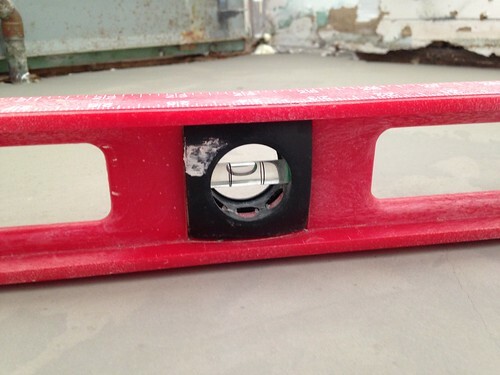 Need to drill a hole through tile? I’ve got a bit for that. 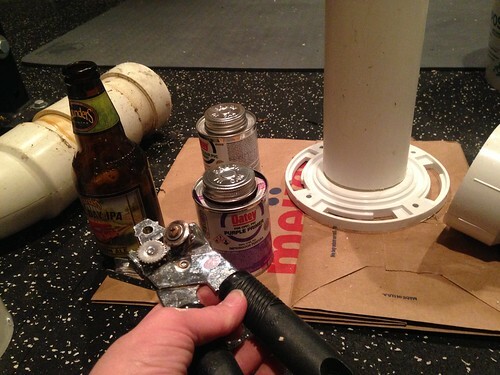 Need to open cans of Oatey PVC primer and cement that I literally cannot untwist the lids from? 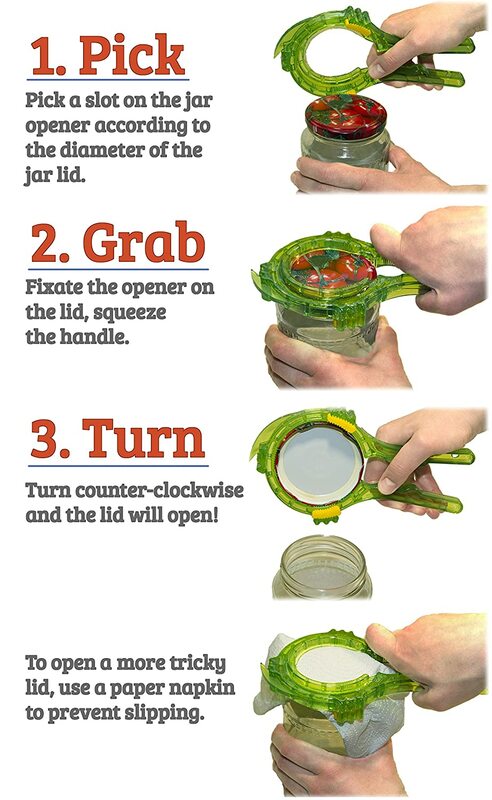 I legit have a designated can opener FOR JUST THIS REASON. 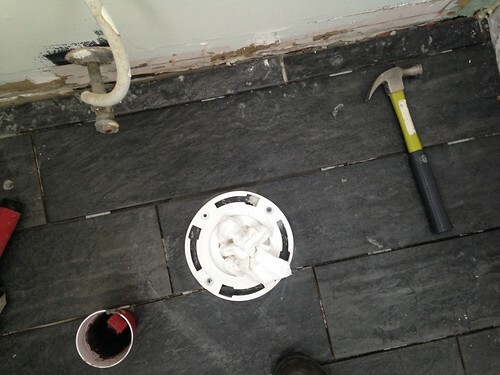 But, despite all the tools needed, at the end of the day I had a well-installed toilet flange. I realize that shouldn’t be so exciting, but seriously, it’s been three years. And I have a working toilet. Also, this is actually a toilet that Delta Faucet sent me 4 years ago to review, so… this is why I don’t do product reviews anymore. I don’t think that after 4 years you can legitimately call this a “sponsored” product (I’m not sure they even make this model of toilet anymore, but they do make other ones.) I will say that one thing I consistently love about Delta faucets–AND this toilet–is the integrated plumbing. Their faucets hook right into the water valve and the same is true of the toilet, which made it a quick and easy install. 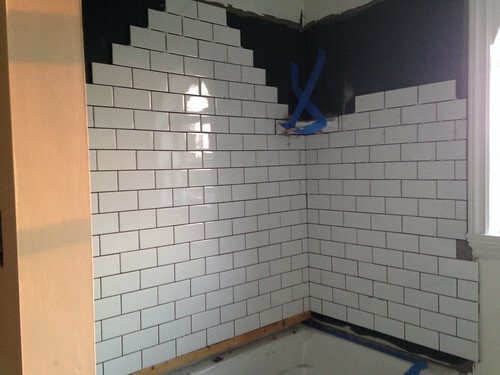 It’s pretty much a working bathroom, you guys! But, before we get ahead of ourselves, it’s still very much not-finished. Install shelving, towel racks, etc. And then there’s a ceiling to paint, and walls to touch-up, mirrors to buy and hang, and a hutch to find to replace the bulky closet I tore out. It’s not exactly “close” to being done, but it’s very close to being functional, which is really what counts around here. 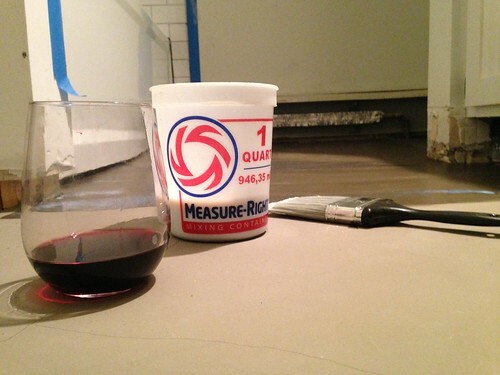 Who knows… if my mom brings up enough wine I might even get the kitchen done this year? I mean. Don’t hold your breath though. I love you with big heart eyes right now, Kit. I bought my house 2.5 years ago (after living in it as a rental for 10)! I had all kind of plans that the minute I closed I was going to get to work on. 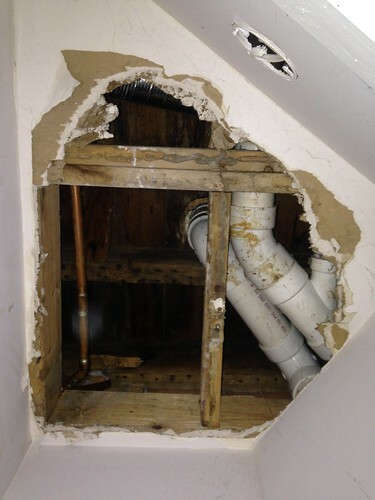 Right now I have a big hole in my master bath (inset shelving plan). Half stripped stairs (carpet removed, treads stained, raw wood risers). 1/2 of my kitchen cabinets painted. 1/2 of my kitchen backsplash removed. 9/10ths of the downstairs painted (I can’t finish painting the kitchen until the cabinets and the backsplash are done). Hardwoods covered in paint because the plan is to replace them. Half ripped away carpet in the landing, because the plan is to either replace the carpet or carry the hardwoods all the way upstairs …. And so many more things. My boyfriend has threatened me with bodily harm if I start another project before I finish one of these things. Congratulations on such progress. And yay for your Mom. May I respectfully suggest that your Mom stay on your case about the remains of this to-do list before shifting her focus to the kitchen? You’ve got a little bit of time before outdoors start in earnest. You should be able to knock off a few more of these finishing touches. Love the tile, kinda looks like a hardwood floor, but in tile. Wondering why I am not getting email notifications for the posts here anymore? …and what is this HomeWood thing?? They lifted her entire post with no credit! Not cool. The homewood thing is a content scraper… they basically steal content from sites like mine and then I have to go through an ordeal to get them shut down. One of the joys of blogging! I’m not sure about the email notifications. It looks like they’re still up and running, but depending on when I post it may take 24 hours to send out. Did you ever get the email for this one? If not I can try to re-set you up in the email list. No, I did not, not the last few…but saw them on FB. Might be my eddress, it’s an old one and going funky with several of the sites I follow/use. Looks great. Yea for Moms!! 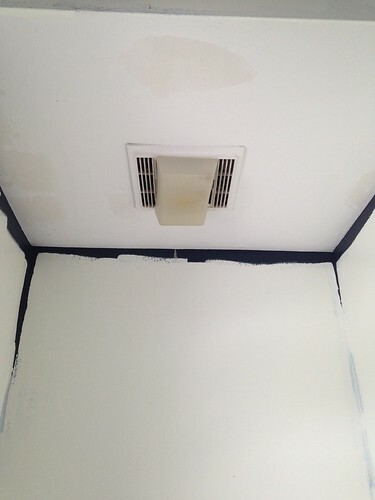 I need you to finish this bathroom because I need you to find a non-hideous light/fan combo. Maybe I’m using bad search terms but I can’t find one stinking non-ugly (I’ve lowered my standards from good looking down to not bad looking) bath light fan combo. I don’t want to put in a separate fan and light because its a small bath in a cape cod home so the slanted ceilings already lack space. Heck it’s your life so if all you do in this space for the next three years is find a fan/light I’ll be a happy random internet stranger. You, your mom and grandma are my inspiration and motivation. I’m redoing my spare room for my very own girl space (my home has 3 sons and a husband so this is a long time coming). 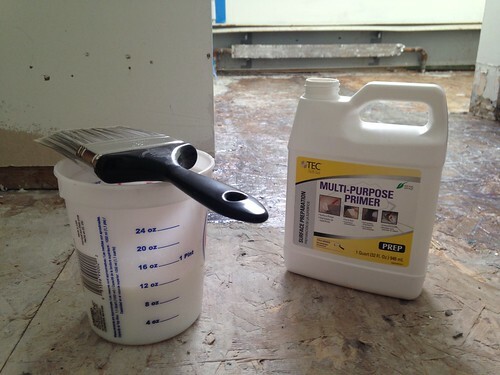 I’ve used your blog to learn about drywall repair and installation, shelving, painting tips, using a mitre saw, drills, chicken care, and more. Keep the posts coming Kit! Excellent work. I love seeing this progress. 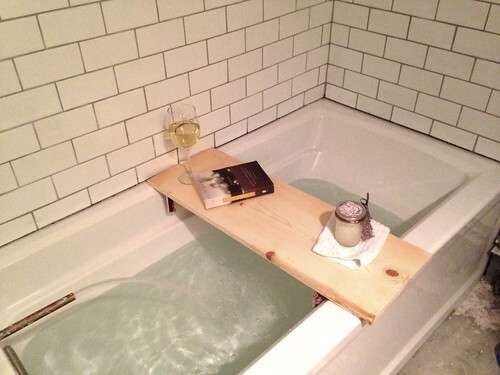 I have the same kind of bathroom which needs work, but is functional. Thank you for the inspiration. KE apex suites and CX reverse herringbone seats for life. Also, lucky was it the door in the Delta One or were you too excited about the Delta one.. I slightly prefer reverse herringbone seats by CX(as mentioned above) more. that is SO AWESOME! love the floor. truly beautiful tile. 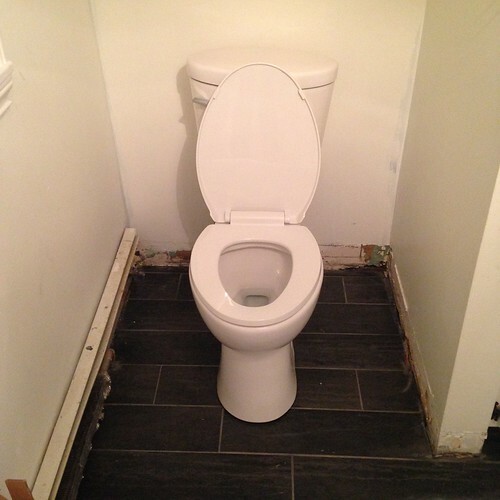 great job, love everything, how exciting to have a toilet upstairs after 3 years!